During the filming of my coloured mascara video I looked into the mirror and realised that the look I had created was reminiscent of a make-up look gone by. The look I am refering to is the May 1975 Vogue Cover featuring Jerry Hall and shot by Norman Parkinson on location in Jamaica. 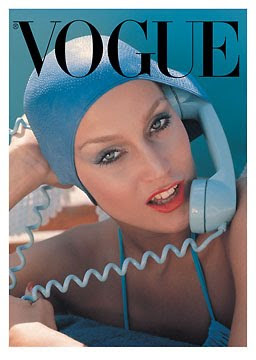 This is such a classic Vogue cover even though the phone tucked into the swimming hat is actually quite ridiculous. This has got me thinking about all the iconic images and looks that are filed away in my head for reference. I will be posting some of them for discussion. The phone is hilarious. Oh how times have changed. Will she stand up, forget about it and jump into the pool? Tee hee. Is it sad that I actually really like the colour of the phone! I love the British Vogue 1990 cover, black and white with Cindy, Naomi, Linda, Tatjana and Christy. It's just so, well 1990's. @Eliza: I *love* that Vogue cover. I was gutted I missed that edition because I was away the week it came out and it was totally sold out by the time I got back. 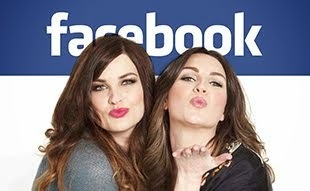 @amber_j - It's that just typical. I remember there was a movie having a massive premiere in my city. A bunch of my favourite actors were going to be there. Landed on the two weeks I was away on holiday. All my mate went and had a ball. Gutted. Any way perhaps you might get your hands on it via Ebay or something. Watched the video, it was great as always. I love that Estee Lauder mascara thats a must purchase, so thank you for letting us know. Where did you get those awesome earings you were wearing in the video? I absloutley love them!!! Well, have you ever seen any portuguese vogue's cover? trust me, you would change your mind about the american one!!! and i agree, love italian vogue, as well as the french one i must add! Great post!